They’re our ever-present garden companions – noisy, colorful and a joy to watch. I’m talking about birds of course! But our feathered friends don’t just make working in the garden a pleasure – they’re indispensible too. All those eyes and beaks make a substantial impact on pests such as aphids, caterpillars and grubs. In winter it’s all about providing food and water to help birds through these lean months. Regular feeding will encourage birds to return repeatedly, so they’ll be on hand in spring to keep pests in check. Leave areas of your garden undisturbed. Hold off cutting back and tidying up ornamental borders till spring. This will provide shelter for insects, which in turn offers a ready supply of protein for insect-eating birds. Don’t forget to include plenty of berry- and seed-bearing plants in your garden. Shrubs such as cotoneaster, hawthorn and yew will hold their berries well into winter. Suitable seeds include those of the truly majestic globe artichoke, sunflowers and, of course, teasel, whose seed heads will stand long after the plants have died back. Winter digging can help to expose slug eggs and the overwintering grubs of other pests to hungry predators, including birds, who in turn will help to bring them under control. Offer birds a selection of foods to keep them healthy. Birdseed mixtures, unsalted peanuts, nyjer seeds and dried mealworms are all welcome. You could also put out leftovers such as cooked rice or potatoes, cooked or raw pastry and unsalted bacon rind and fat. Birds like stale or hard mild cheese too, but avoid soft cheeses, and strong cheeses, which are too salty. Leave food out on bird tables or fill squirrel-proof hanging feeders with suitable seed and nut mixes. Hang feeders where birds have a good view of their surroundings and can fly away if they’re threatened. Don’t put too much food out at once and check and refill feeders often to ensure a continuous supply. Don’t forget tree fruits such as apples and pears, which can be suspended or placed directly onto the ground for ground-feeding birds – a great way to use up blemished fruits that aren’t storing well. Chop the food up and scatter it over a wide area so birds can feed without competing with one another. Bird cakes are very easy to make and your winter visitors will love you for it! Begin by mixing a selection of dried ingredients in a bowl. Suitable ingredients include crushed, unsalted peanuts, sunflower seeds, grains, mealworms, dried fruit and breadcrumbs. To bind the dry ingredients together you’ll need to melt some animal fat, such as suet or lard, on a low heat. You could use coconut oil for a vegetarian alternative. Once it’s melted, pour the fat into the bowl, aiming for one part fat to two parts dried ingredients. Mix well to combine. The fat mixture can now be used to fill moulds such as old yogurt pots, or smeared onto pinecones. Spike a hole into the bottom of the yogurt pot then thread a piece of string through. Tie a knot to secure the string to the bottom of the pot, then tie on a stick to serve as a perch. Now fill the pot with the fat mixture and put aside to set. Or pour the mixture into a flexible container to make a loaf of bird cake. Once it has set, remove the cake from the container and place it into a wire cage bird feeder ready for hanging up. Tie string onto the base of a pinecone, then smear the cone with the part-set fat mixture to thoroughly coat it. Hang your feeders in the garden and enjoy the frenzy of feeding as your feathered friends tuck into your home-cooked treats! Water is essential for both drinking and washing. Clean feathers give birds better insulation from the cold. 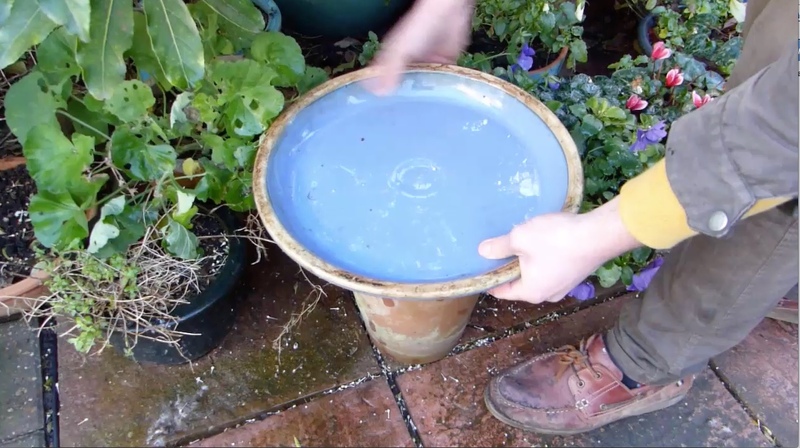 You can use a purpose-built birdbath or improvise with, for example, a dog bowl or upturned dustbin lid, with a rock in the middle so the birds can easily get in and out of the water. Keep water levels topped up and clean it out regularly. In really cold regions you could use a birdbath heater to stop the water from freezing solid. Or make your first job of the day to put out fresh, warm water so that birds can bathe and preen their feathers. Help out your garden birds in winter and they’ll return the favor during the growing season by keeping pests in check. How do you look after your feathered visitors during the colder months? Please let us know in the comments section below. "I am going to try this for the birds"
"That is brilliant to hear Gloria. I am sure they will appreciate it. "